Hello there! Happy Monday and Happy September! I was MIA here last week as it was a hectic week at my day job. But I’m back this week feeling all the fall vibes and armed with some cozy recipes that are fitting for the season! Is it feeling like fall where you are? While the temperatures were warm in St. John’s this past weekend, fall is definitely creeping in. The sun is setting a little earlier every day, and there is a slight chill in the air. Break out the sweaters, fall is officially on the way! And with the cooler temperatures, my mind is turning to warm and comforting bowls of soup and chili, and pasta dishes loaded with veggies, sauce and cheese (in moderation, of course)! 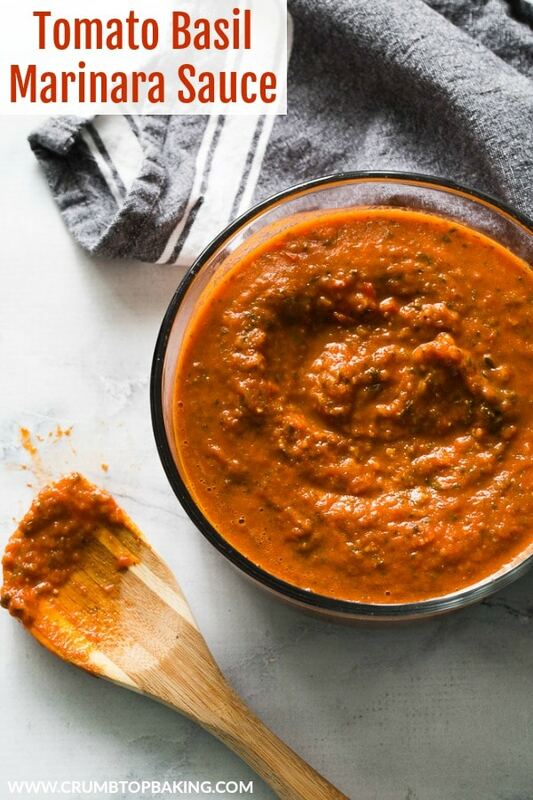 To ease the transition into all the hearty meals that fall has to offer, I’m sharing this Tomato Basil Marinara Sauce recipe today. It’s packed with lots of seasonal ingredients, including fresh, local herbs, and lots of onion, garlic and jalapeño. 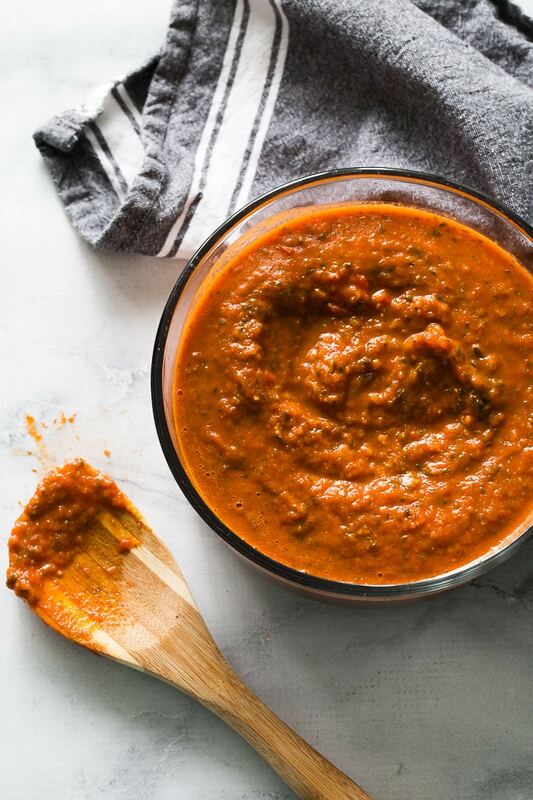 It’s the perfect sauce to have on hand to help with busy weeknight dinners. I’ve been recipe testing this one for a few weeks now, and it has been a welcomed addition to our lunches and dinners! You can use different types of tomatoes for this recipe, such as cherry or vine tomatoes, but I prefer roma (or plum) tomatoes. They are a little less seedy, and their texture and flavour are perfect for sauces. This sauce is made in my trusty cast iron pot. I tried it a few times in my Instant Pot but I could never get the marinara as thick as I wanted. If you have luck with this recipe in the Instant Pot, be sure to let me know. 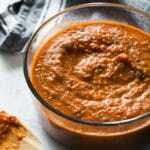 I used my handheld blender to blend up the ingredients as it gives me more control over blending, and therefore, the texture of the sauce. But if you don’t have one, you could transfer the marinara mixture to a blender. Just be sure to let the mixture cool slightly before doing so, as not all blenders will be able to withstand the heat. If you want to thin out the marinara sauce a little bit, just add a splash or two of wine or veggie stock at the end! 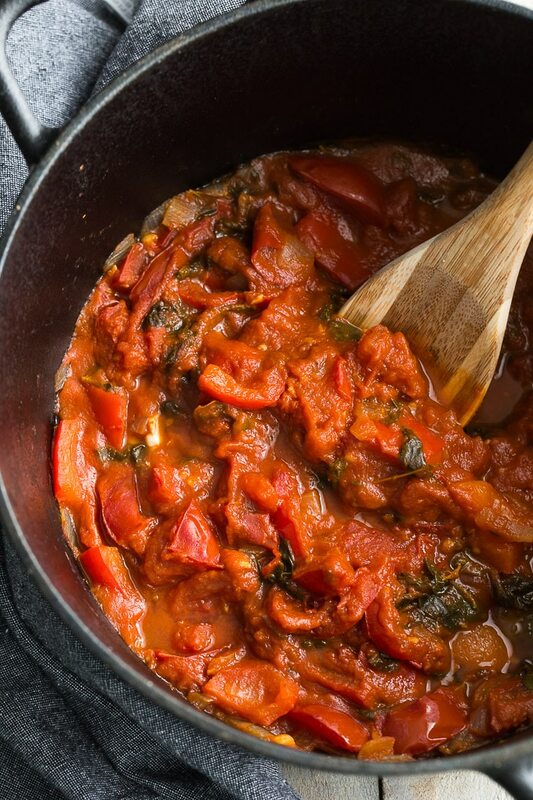 As mentioned, this Tomato Basil Marinara Sauce works beautifully with meatballs, pasta or pizza. It’s also great with zucchini noodles, as well as with stuffed peppers (recipe coming soon)! 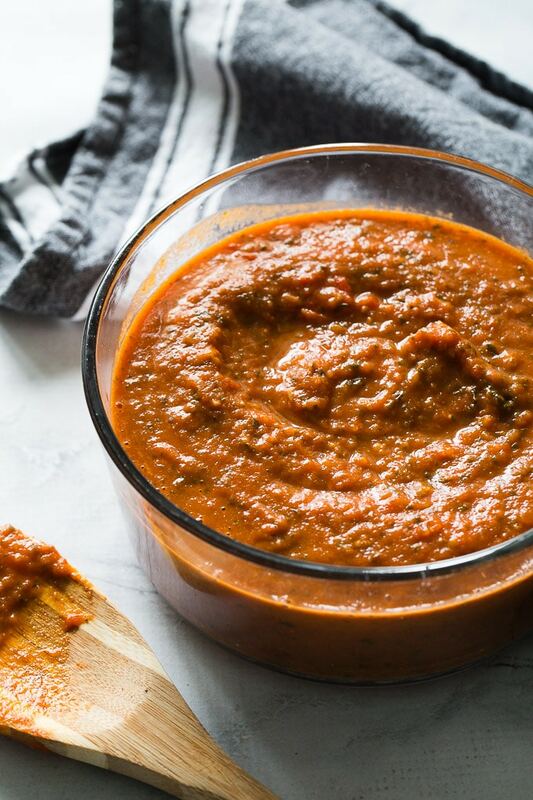 If you make this marinara sauce, I would love to know what you pair it with. Feel free to leave a comment below, or take a pic, post to Instagram and tag @crumbtopbaking! Thanks Dawn! Absolutely agree, marinara is perfect to have on hand when the weather gets cooler! 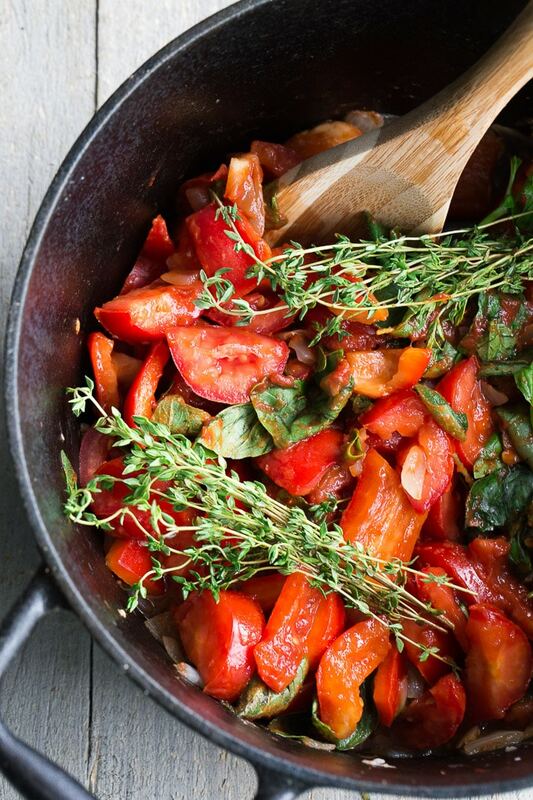 Love your idea of adding a splash of balsamic vinegar to the sauce. I’ll have to give that a try! It’s not fall-like at all here in Phoenix–today was a high of 106 and it barely cools off at night. But I’m cooking and baking like fall is in full swing because I’m ready for boot and sweater weather! As much as we ever have that here :). I’m definitely going to have to add this to my dinner rotation because it sounds so comforting and delicious! Plus, I never turn down pasta. Or pizza. Or anything carb-y. Have a great week, Leanne! That heat sounds intense. I hope it cools down for you soon Kelsie! I’m in full fall mode now and looking forward to breaking out my sweaters and boots too! But my fave is the fall baking! If you make this sauce, would love to know what you think, and how you use it! Take care! Thanks Tanya! 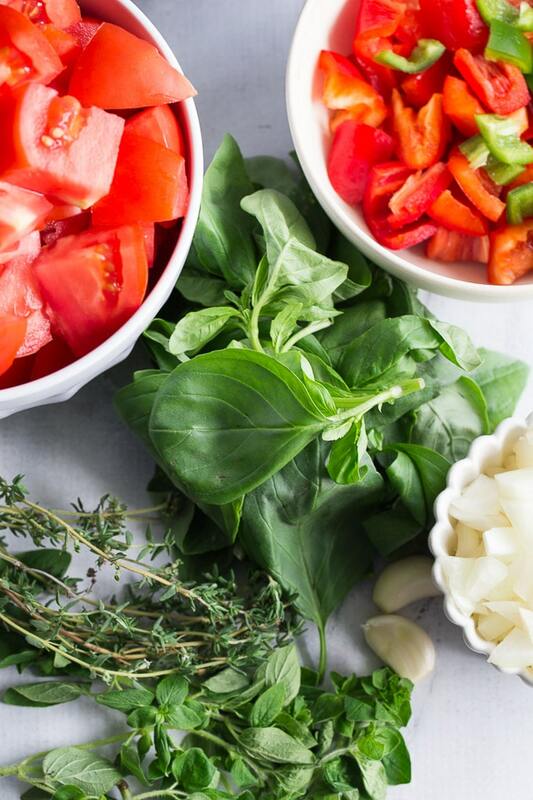 I agree, marinara is perfect to have on hand for quick dinners throughout the week. And yes, it creates a great smell in the kitchen! Hope all is well! One of my go-to recipes is marinara sauce and I love having it in the freezer for “emergencies”. 🙂 This looks so delicious and I love that you used fresh tomatoes. I would love it over spaghetti squash or zoodles! Thanks Marcie! I’ve tried it with zoodles, and I’m planning to try it on spaghetti squash soon! Definitely a great idea to stash some of this sauce in the freezer for emergencies! Great recipe! I love the idea of adding he jalapeños for a bit of heat. And amazing pics as usual! Thanks Terry! Appreciate it. Always love adding jalapeños for some extra heat! Take care! I have never made marinara sauce from scratch, so I am totally pinning this!! Plus totally love that there’s no added sugar to this! YESSSSSS!! I only started making my own marinara recently, but I’m so glad I tried it. And yes, there’s no added sugar and you don’t even miss it. Hope you get a chance to make it Kelly! Thanks! I love homemade sauces! Thanks for sharing! Gosh this looks delicious!! Perfect for cooler weather which arrived quite quickly here in Calgary! And love the addition of jalapenos too – love a little heat! Thanks Jessica! Yes, we love a little heat in our dishes! Jalapeños are a staple in our house! Stay warm! That sounds and looks really tasty! Yes, many ways to use it and appreciate the bright flavors of summer that are blended in the sauce! Thanks Nicoletta! Love the many uses for homemade marinara! This sounds like a perfect homemade sauce. So great to have on hand for those lazy winter days! Sounds delicious, I love all the vibrant ingredients. Thanks Kristen! It’s a great recipe to meal prep on the weekends. I imagine I will be stocked up on this for winter! That looks so healthy, rich and delicious! I love the fall flavours. I’ve never made my own marinara and really need to try this! Thanks Terri! I don’t know why I waited so long to start making my own marinara! It’s pretty easy and so flavourful!